The Cleveland Browns have gone 0-9 to start the 2016 NFL season. But they’ve also lost 12 games in a row dating back to last season. 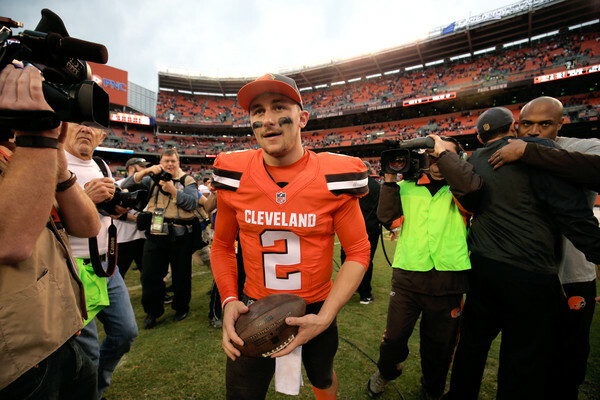 Johnny Manziel, surprisingly, was the last Browns quarterback to be part of a win. I’m not a huge fan of measuring quarterbacks by winning record like they’re pitchers. I’m not a fan of that statistic for pitchers as well. But facts are facts, numbers are numbers. The Browns might have had better quarterbacks on the field since Manziel started for them in their win over the San Francisco 49ers last December, but none of them have been able to take the Browns to victory. Austin Davis actually played a game last season, the finale, a loss to the Pittsburgh Steelers. He is now part of the Denver Broncos setup, sitting behind Trevor Siemian and Paxton Lynch. Robert Griffin III started in one game and that was it. He was signed with the intention of building him back up to be a solid NFL quarterback, and maybe become a franchise player for the Browns. But he injured his shoulder so badly on the first game, that it’s unlikely he’ll play another game for Cleveland, not this season or at all. So after Griffin, the Browns turned to Josh McCown, who struggled for them last season. That didn’t last long either. He’s started two games, and is actually the only one of the Browns quarterbacks averaging over 200 passing yards per game, but things haven’t ended in a victory under his watch either. Cody Kessler has started in six games for the Browns. The former USC quarterback wasn’t supposed to be in this position, but the NFL created weird and different paths towards achieving your goals. However, Kessler hasn’t really carved out a niche and place for him. His numbers aren’t bad at all: 67.5% completion ratio, 5 TDs to 1 INT, a 96.1 passer rating. Maybe there’s a future here. But the premise is that a good quarterback is capable of grinding out wins, even on a team as bad as the Browns. Or maybe the premise is completely wrong. Kevin Hogan, the rookie out of Stanford, has played a bit. Charlie Whitehurst, who always pops up somewhere for some relief action, has played in one game. At a certain point the Browns turned to Terrelle Pryor, who has developed into a very good receiver, to throw a bit out of the pocket, like he initially did when entering the NFL. That hasn’t helped, and that isn’t a solution. Neither is bringing back Manziel. The Browns knew this season was going to be rough; what season isn’t in Cleveland, winning more than five games in one season just once since 2008. But going winless through the first nine games? Ranking 29th on offense and 31st on defense? Looking like a lock to finish the season 0-16? That’s not how Hue Jackson hoped to begin his career as a head coach, and as patient as the Browns would like to be, not winning even once for an entire season could be too much for Jackson’s reputation to withstand.